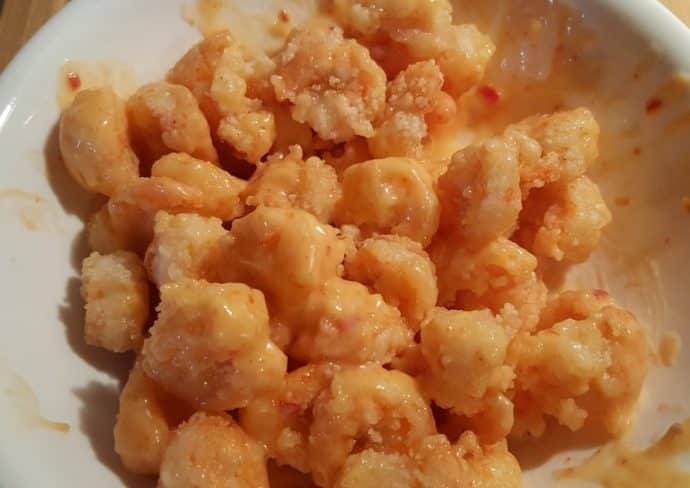 Bang Bang Shrimp is a popular appetizer at both Bonefish Grill and The Cheesecake Factory. It’s surprisingly easy to make and totally delicious. Bang Bang Shrimp is a popular appetizer at both Bonefish Grill and The Cheesecake Factory. This recipe is a really good copycat of Bonefish Grill’s version. While The Cheesecake Factory is one of my favorite restaurants, because I’m in love with their Santa Fe Salad (and eat it almost every time I visit), I’ve only had the Bang Bang Shrimp at Bonefish Grill. When we lived in Boynton Beach, Florida, there was a Bonefish Grill right across the street and we fell in love with the Bang Bang Shrimp. I was determined to make a copycat version and this version is pretty spot on. I find that using either buttermilk or an egg white to “wet” the shrimp before coating work well in this recipe. Today, I used an egg white. 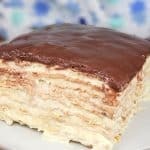 Using Potato Starch instead of flour in this recipe makes this Gluten Free! 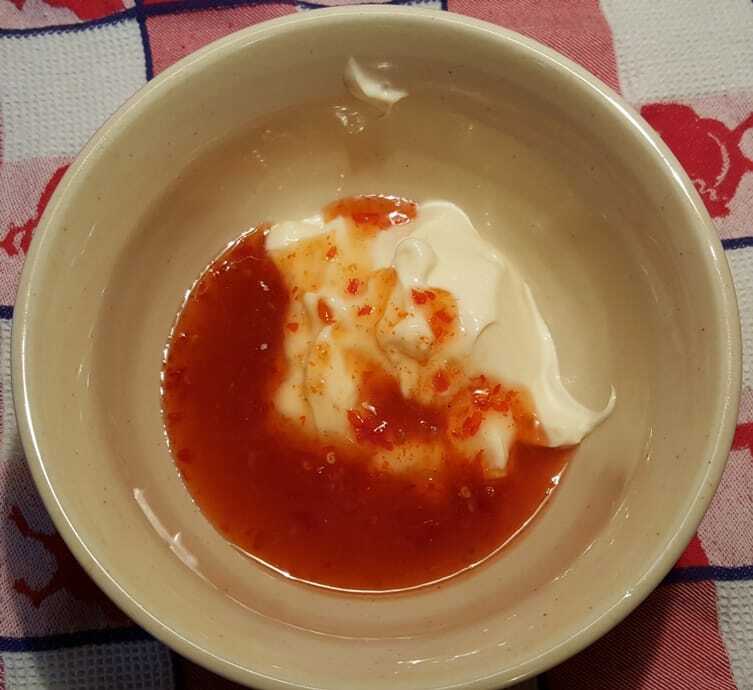 Add the Mayo, Garlic Chili and Sweet Chili Sauce ingredients to a small bowl. If you want a spicier sauce, add more Garlic Chili than is recommended. The recipe as written, is for a very mild spice factor. 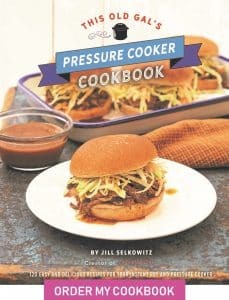 Whisk it up well and adjust the heat here. Set it aside, as once the oil gets hot, the shrimp will cook really fast. 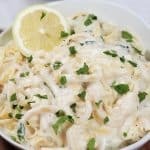 Place the shrimp in one Small Mixing Bowl with the egg white (or the buttermilk) and have another Larger Mixing Bowl ready with the Potato Starch. 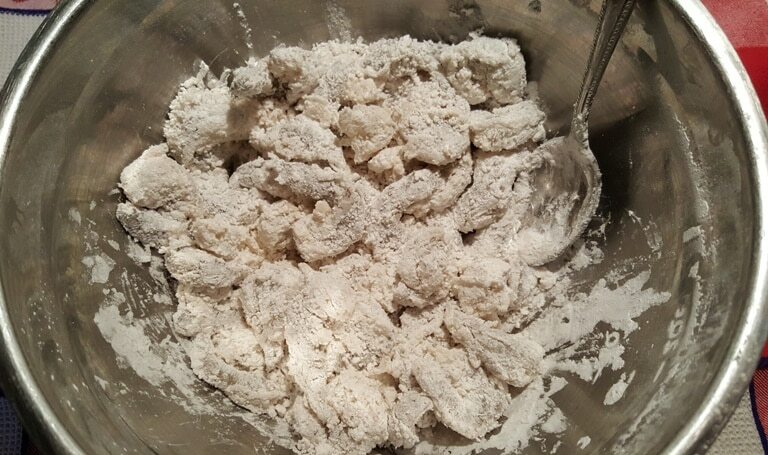 Use a spoon or a fork, not your hands to dredge the shrimp in the Potato Starch, otherwise, the Potato Starch will stick to your hands and not the shrimp. 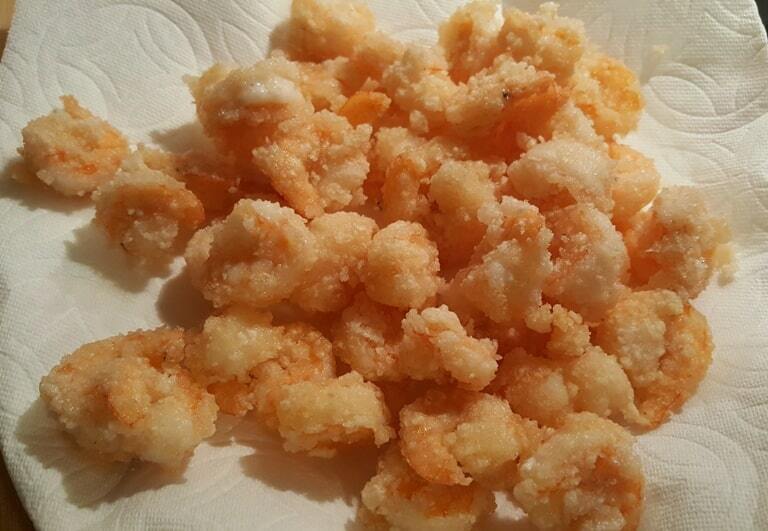 Make sure each shrimp is completely covered in Potato Starch and not clinging to another shrimp. Place the Bowl of shrimp in the refrigerator until you are ready to cook, as it will take some time for the oil to get to temperature. Heat your wok or, in my case, my deep cast iron chicken fryer, as I like to call it and then place about 3 inches of oil your wok or chicken fryer. It’s gonna take about 15 minutes to get to temperature. 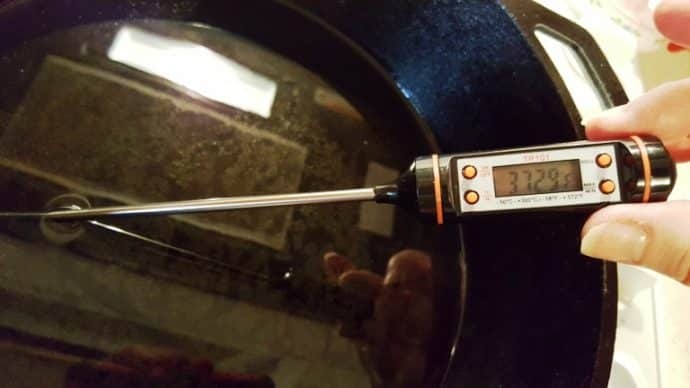 Check the temperature with a Thermometer. Around 375 degrees is good; it doesn’t have to be exact. Add the shrimp in batches. For the one pound of shrimp, I divided into three batches. Break up the shrimp with your Bamboo Strainer right away, if any start to cling together. The shrimp will turn pink, almost right away. You want to make sure the crust is crisp and not soggy. This will take about a minute, give or take. 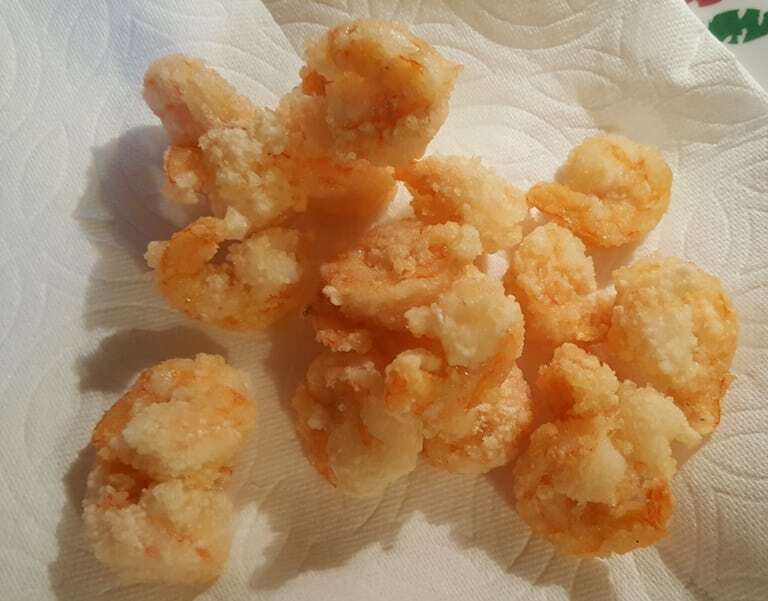 Pull a few shrimp out and place them on a paper towel to drain. Check to see that they feel crisp. 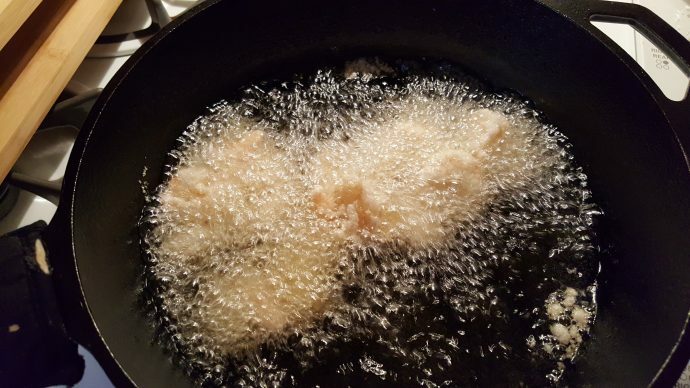 I can’t give you an exact number of minutes that the shrimp need to fry in the oil because everyone’s stove is a bit different. 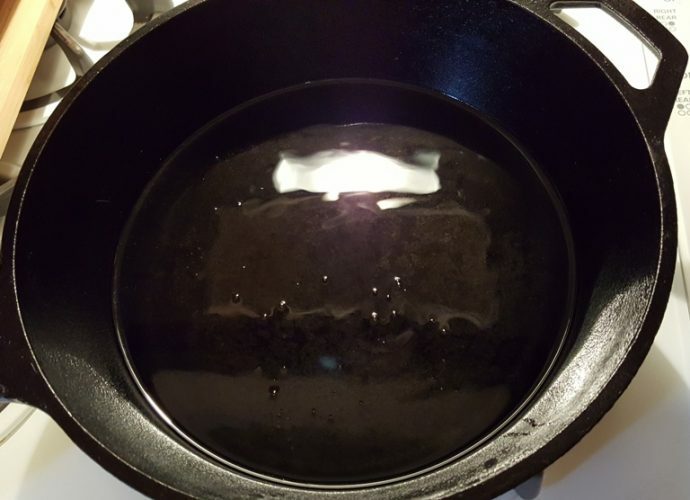 Some pans may have hot spots, or the oil temperature is not the same. 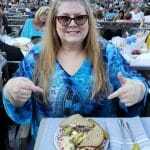 A ball park time is one to two minutes. Just keep pushing them around and break up any that join. Continue to cook the shrimp until they are all done and then turn off the stove. The coating should feel dry and firm. Without the sauce, they taste almost identical to the butterfly shrimp that used to be served at Chinese family style restaurants. 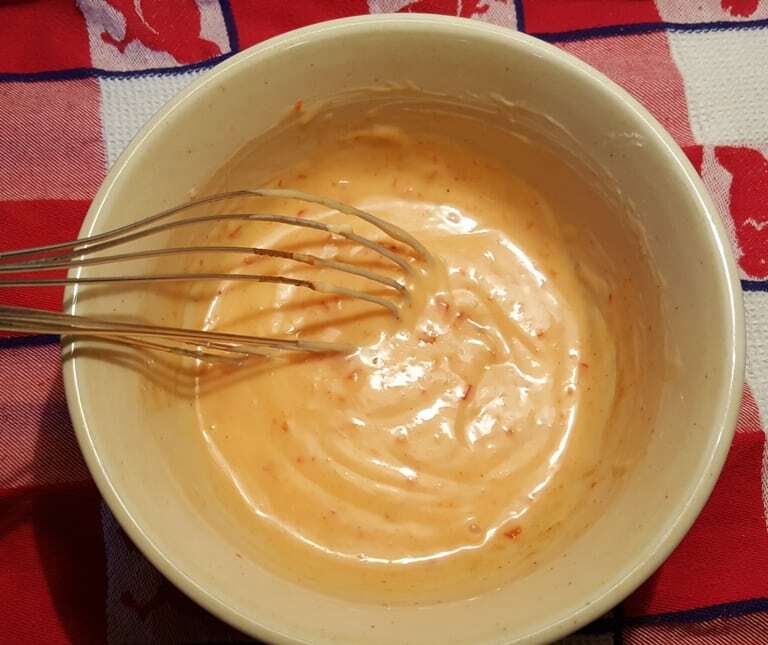 Place the shrimp into a Larger Mixing Bowl and pour on the sauce. Start with just half of the sauce, as you can always add more, but can’t remove any. Some people like less sauce than others. Garnish with chopped scallions and serve with Thai Triple Coconut Rice, if you like. 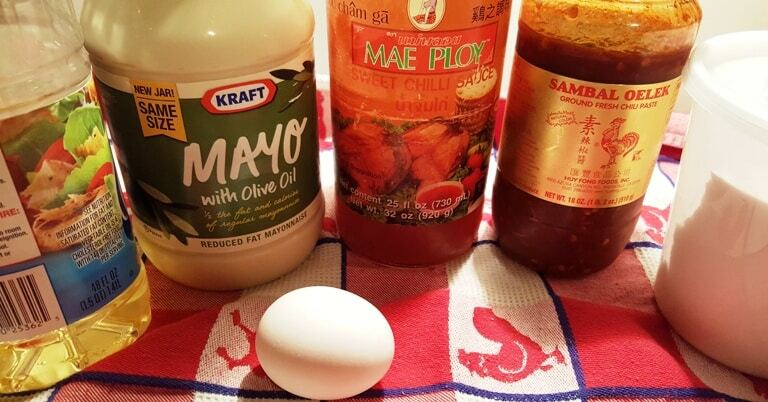 Mix together mayonnaise, Thai Sweet Chili Sauce and Chili Paste and set aside in refrigerator. 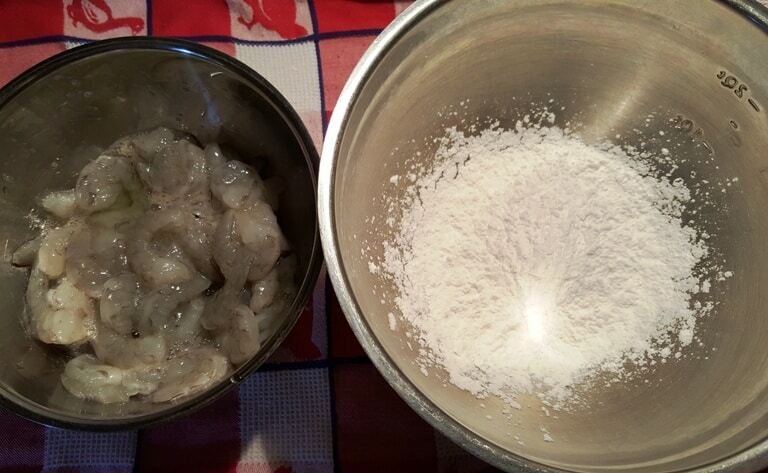 Clean shrimp by removing shell, tail and intestinal (black line) tract. Heat oil to approximately 375 degrees. Working with small batches, drop shrimp into hot oil and cook until pink and lightly browned, about a minute. Remove from oil and drain on paper towel. Repeat until all shrimp have been fried. Place shrimp in medium bowl and pour on the sauce. Coat well. 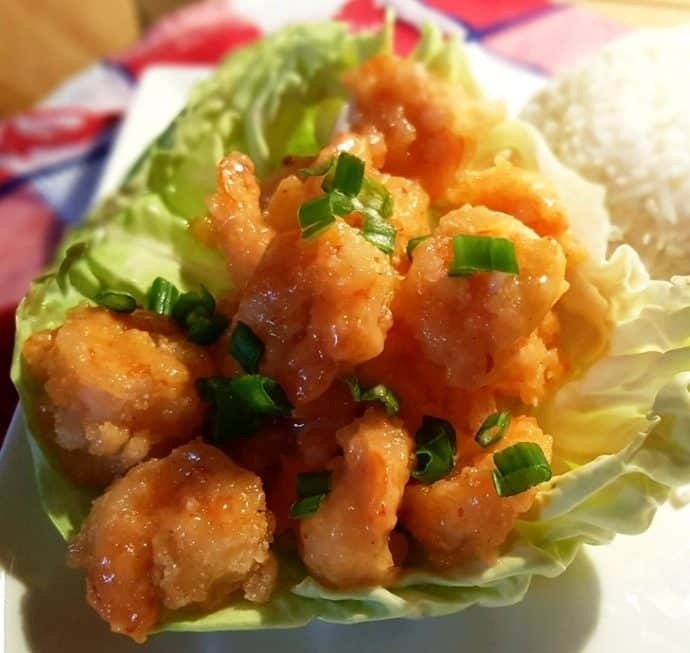 Serve Shrimp in lettuce or cabbage leaves and garnish with sliced Scallions. Bang Bang Shrimp make great taco stuffers and PoBoy sandwiches. Garlic Chili Paste is nice too and gives more of a kick. 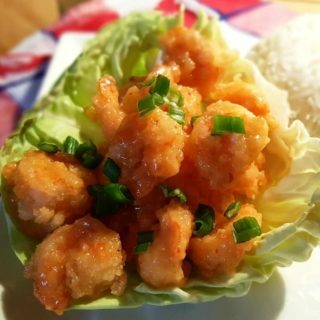 PIN this Crazy Good Bang Bang Shrimp! Wrote down the ingrediens… will be making this for sure! This is one of my favorite things….very addicting. I would think you could, although I have not done it yet. 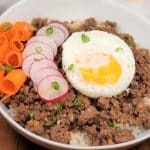 I love this recipe so much. I would probably try 340 in the air fryer, until the coating feels crisp. Let me know how it goes. The recipe ingredients list Sambal Oelek Ground Fresh Chili Paste. However, the instructions list Garlic Chili Sauce. Which is it? Either one is fine. I use the Chili Paste. Some like more of a kick and use the Garlic Chili Paste. Sambal Oelek is the best! 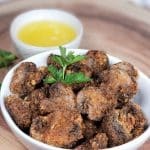 Have you tried to make the shrimp in the air fryer? Love to make this but too hot to cook these over a hot stove/oil. 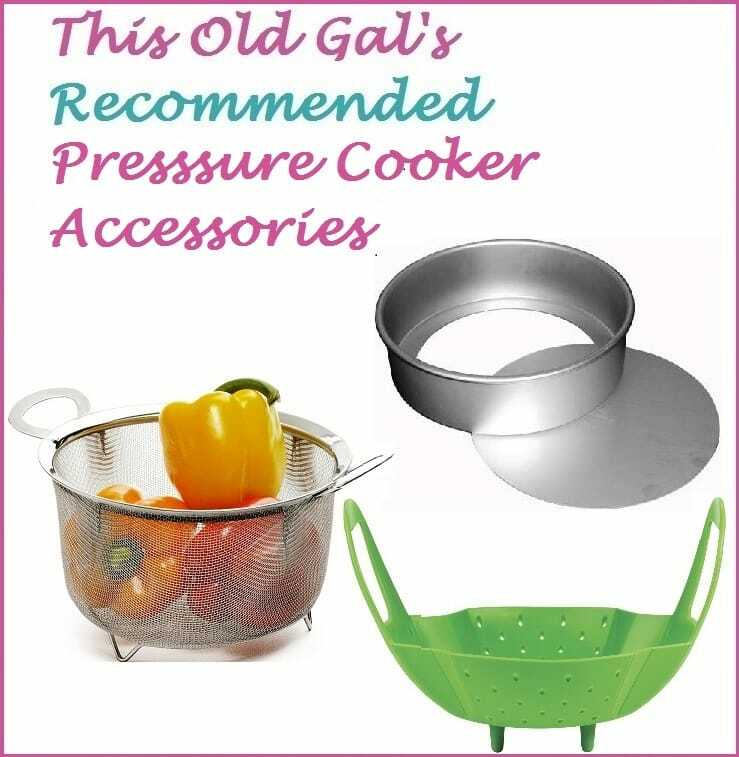 Can this be adapted to an air fryer? Sounds delish but I rarely deep fry anything.